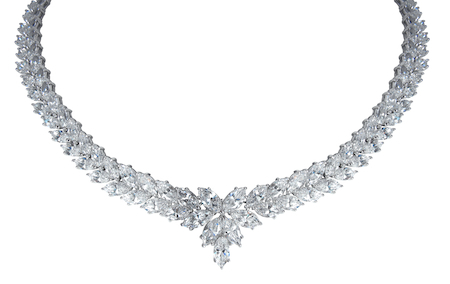 The Harlequine Marquise Cubic Zirconia Cluster Estate Style Necklace is an estate piece to be treasured and passed down to the next generation. 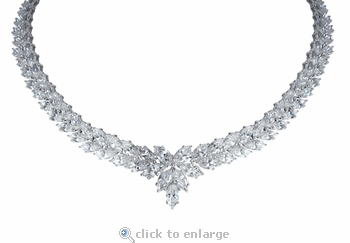 An extravagant amount of marquise cut diamond quality cubic zirconia stones are basket set in a stunning arrangement. 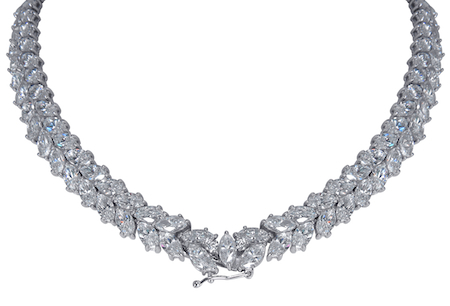 The necklace measures 16 inches in length and secures with a single safety clasp. An 18 inch length is also offered. The total carat weight includes approximately 93 carats of the finest hand cut and hand polished original Russian formula cubic zirconia. Choose from 14k white gold or 14k yellow gold, please see menu options. For further assistance, please contact us directly at 1-866-942-6663 or visit us via live chat and speak with a knowledgeable representative.